Let us give another reason to smile…. There is no better complement to a beautiful smile than great-looking skin. At our office, you can benefit from two of the most popular and effective FDA approved wrinkle fighters to improve and prevent the noticeable signs of aging: BOTOX® & Dermal Filler. BOTOX® is used to safely and effectively relax facial muscles to correct existing lines and prevent new wrinkles from forming. 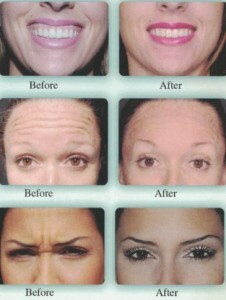 It will improve the appearance of frown lines, forehead creases, crow’s feet,and gummy smiles. Juvederm is a hyaluronic acid base dermal filler that helps reverse the signs of aging by instantly correcting, enhancing and restoring volume to a more youthful state. Dermal fillers are used to reduce or eliminate wrinkles around the smile, lift the corners of the mouth, enhance lips, and replace soft-tissue volume loss. Besides relief from jaw pain, tension and headaches, patients see a dramatic change in appearance after 2-3 sessions of BOTOX® treatments. The square, heavy appearance of their lower face softens into a more narrow and aesthetically pleasing one. What are the benefits of the Gummy Smile BOTOX® treatment? An injection of BOTOX® above the upper lip reduces the lifting action of lip muscles, thus reducing the display of gum tissues. Treatments provide patients with a more aesthetic and beautiful smile. 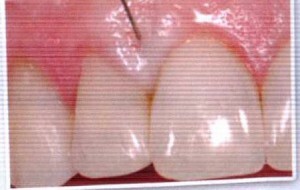 What causes black triangles between teeth? Who are good candidates for the black triangle dermal filler treatment? Good candidates include people who like their teeth but are concerned with small gaps between them. Dermal fillers can help fill in these gaps, leaving the shape of the tooth alone. How long do treatments take and last? Treatments takes approximately 5-10 minutes. Patients can expect the results to last 8 months or longer. Ask our office about safe and effective dental treatments. 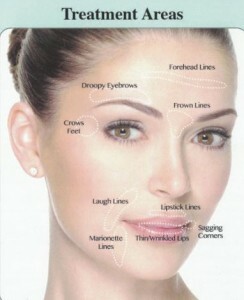 BOTOX® is a proven alternative to help you alleviate symptoms and provide instant relief. TMJ disorders refer to a collection of jaw problems that may be treated by a dentist. The jaw joint is a complex one, with a number of structures that facilitate vertical and lateral movement’s muscles, ligaments and nerves that help the joint perform correctly. A misaligned jaw can also lead to TMJ disorder. The BOTOX® alternative treatment for TMJ disorders and jaw tension is usually quick and effective. Who is a candidate for BOTOX® Jaw Treatment? BOTOX® is a safe alternative treatments for most people who experience jaw tension or have a TMJ disorder. This treatment helps to alleviate pain from many joint and muscle spasms associated with TMJ. Bruxism is a specific condition in which people grind or clench their teeth, often while sleeping (most do so involuntary). Grinding or clenching causes the muscle to grow stronger, resulting in headaches, earaches, or facial pain, which worsen with time. What are benefits of the BOTOX® Bruxism Treatment? BOTOX® treatments have been shown to alleviate bruxism. BOTOX® Bruxism treatment works by relaxing the jaw muscle sufficiently to reduce grinding symptoms while maintaining normal jaw and teeth action. How long does the BOTOX® Bruxism treatment take? BOTOX® treatment of teeth grinding is painless and quick (5 minutes). Results from BOTOX® treatment of bruxism start two to three days after injection and last for about 4 months. While bruxism can lead to TMJ problems, the category of TMJ disorders is much broader. Issues with any component of the jaw joint may be classified with the TMJ disorders. Further compromise of the airway, making obstructive sleep apnea even more possible if you have tried to treat your TMJ disorder with mouth guards and other measures without any improvement, you should ask our office about the benefits of the TMJ BOTOX® Treatment. If you have tried to treat your TMJ disorder with mouth guards and other measures without improvement, ask our office about the benefits of the TMJ BOTOX® Treatment.